Editor’s Note: With declining values come lawsuits and complaints. Somebody has filed a complaint against you with your state’s appraisal board. Now what do you do? Tim Andersen, MAI gives you some suggestions. Somebody has filed a complaint against you with your state’s appraisal board. Now what do you do? This is not the end of the world. There are steps you can take to protect yourself. The purpose of this article is to show that it is possible to fight the charges when the state files a complaint. It is a fight that you cannot fight alone, however. It makes sense to have an attorney and a USPAP (Uniform Standards of Professional Practice) expert on your side. Many appraisers think that, under U.S. law, you are innocent until proven guilty. That applies only to crimes. Since the state files an Administrative Complaint against you, the appraiser, but does not charge you with a crime, the convenience of the Constitution does not apply. So in the eyes of the state you are guilty until you prove yourself innocent (or the state drops the charges). Many E&O insurance policies provide a defense for complaints (ask your agent). Whether or not your insurance company does, you do need an attorney. Remember: the state has a whole corral full of attorneys who are salaried employees (not on commission as is an appraiser) and it will send any or all of them up against you as part of prosecuting the complaint. Getting your own attorney to protect you against the state’s attorneys is therefore imperative, even though it can be expensive. As part of defending yourself, ask your attorney to request an extension of the time limit to respond to the complaint. Such requests are routinely granted. Your extension request puts the state on notice that you are taking the complaint seriously and intend to respond to it, not merely roll-over and accept the state’s settlement offer (if there is one) or, even worse, ignore it. 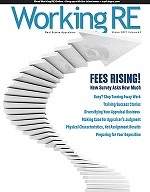 Under certain circumstances, failure to maintain a proper workfile is a violation of USPAP’s Ethics Rule, and it is a charge that most states make pro-forma any time they file against an appraiser, especially if the violation the state alleges was before the imposition of the new Record Keeping Rule. Note, however, that USPAP allows for the electronic storage of data, so there is no requirement that you must have a paper workfile or that you can have only one workfile. The important factor here is that, with reasonable notice, you must be able to access your (electronic) workfile(s) and then provide the state with a complete copy of the data in those workfiles. Most states appear to want a paper copy and may require you to make paper copies of everything you have stored electronically. This could take some time, thus another reason to file an extension. When the state’s investigator calls on you (which is technically before a complaint is filed), provide the workfile(s) and be courteous but then inform the investigator that you will be happy to answer any of his or her questions but only through your attorney. The investigator is essentially the state’s detective and you are already guilty in the state’s eyes. Therefore, whatever you say to the investigator can and will be used against you by the state. Thus all questions the investigator may have must be run past your attorney and all of your answers to the investigator must come from your attorney. It’s likely that your attorney is not an appraiser and therefore not familiar with the USPAP, even though USPAP is incorporated into your state’s appraisal statute(s) by reference. Therefore, it is also likely that you are going to need to retain a USPAP expert to consult with you and your attorney and possibly function as an expert witness. The purpose of the USPAP expert is to go over your workfile and appraisal report to determine if they are USPAP compliant. Your expert will then also go over these items to see if the state’s complaint is congruent with USPAP’s requirements or if the state is just blowing smoke. For example, recently I was involved with a 2008 complaint in which the state chargesd the appraiser with failure to “…discuss, analyze or reconcile the current opinion of value with the Subject Property’s prior sales price…in …2007.” The key concept here is that USPAP has no requirement that the appraiser “reconcile” his or her current opinion of value with a sale of the property within the last three years. Clearly, the recent sale must be analyzed and then that analysis and the appraiser’s conclusion of it be made part of the report. But USPAP does not require the appraiser to reconcile past sales with current value opinions. Another part of the charge is that the appraiser used the “…[i]ncorrect census track [sic] for the subject property.” Ignore the fact that the attorney prosecuting the complaint does not understand the proper term is census tract; concentrate on the fact that USPAP has no requirement that census tract data even be present. That’s likely a client’s requirement. But state statutes do not incorporate client requirements such as census tract data, thus the state’s allegation that the appraiser has violated USPAP or state statute by omitting has no basis in USPAP. The state also charged the appraiser with making “…[i]nconsistent adjustments in the Sales Comparison Approach….” Just so you’ll know, USPAP does not even require you to make adjustments in the Sales Comparison approach. Further, the state does not define what “inconsistent adjustments” are since it also neglects to define what consistent adjustments are. And where in USPAP does it state that adjustments must all be consistent? Do all vacant residential sites have the same value per square foot or per font foot? Does the market assign the same depreciated values per square foot to all of the houses in a neighborhood? Do the older houses in a neighborhood have the same effective ages (and, thus, values per square foot) as the houses there that have undergone renovations? In this same case, the state charged the appraiser with failure to make a proper time adjustment on one sale, even though that sale occurred within three (3) months of the appraisal’s effective date. In my opinion, this particular state has brought these charges to have something to give up if the complaint gets to the negotiating stage. Unfortunately the appraiser must pay the attorney and the USPAP expert while the state gets to the negotiating stage. Therefore, for a state to make and then try to prosecute such charges amounts to nothing more than railroading the appraiser. It is reasonable to conclude, then, that because states are willing to take such steps, you need to have both an attorney and a USPAP expert as part of your defense team if your state brings charges against you. You can defend yourself against your state’s charges! Note: OREP’s Errors & Omissions insurance for appraisers does include defense costs for complaints. Call OREP for details: (888) 347-5273. Purchase Andersen’s webinar, Complaints: What to do When the State Board Comes Calling, where he goes more in depth. Click here to buy now. Timothy C. Andersen, MAI has been in real estate and consulting since 1975. He is a commercial real estate appraiser, AQB-certified USPAP instructor, USPAP consultant, Special Magistrate for the Palm Beach County Value Adjustment Board, author, Instructor and expert witness. As a USPAP consultant, he works nationwide as an expert with appraisers whom the state has charged with license law violations. He is an instructor with the Appraisal Institute and has worked all over the U.S. with various proprietary schools, as well as a community college. The University of St. Thomas in Minneapolis, MN recently awarded him a Master of Science degree in Real Estate Appraisal. Tim’s e-mail address is maitca@bellsouth.net. I just went to my appraisal board for 2 owner complaints. Both complaints were ridiculous. One wanted me to go to a golf retirement community to get comps, and the other complained because he got a CMA and my price per sf was lower than the average. I got a warning on one of them. I was very surprised, because my reports and work files were very solid. I got a warning because my Cost Approach cost for garage was too low, and my land value was below 15%. They said that land values should be between 15 and 25 percent. They were also upset because I did not make landscaping adjustments. Out of the 7 comps I used, one was a 2 story home, and I did not make an adjustment. I did not expect any of these types of convictions. I have made a note to cover all of these items on future appraisals. From what I read in your article, these items probably were not USPAP violations. I didn’t think so either, but since I only got a warning, I considered myself lucky, and went bacl to work.